This graphic shows how an idea started by one person (Algot Runeman) and shared on a blog (at http://runelab.org/wordpress/?p=365) is then re-mixed by another person (Kevin Hodgson) and then another (Dan Bassill). Invitations are extended for others to re-mix this again, and again, using different formats. 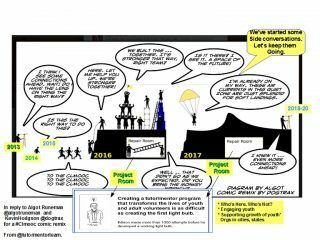 In total, the original, and each re-mix, show how the on-going participation of many different people in the #clmooc process can lead to stronger relationships, deeper learning, and perhaps conversations and solutions to complex problems. This work by Daniel Bassill is licensed under a Creative Commons Attribution 4.0 International License.